Recently I came across Jessica's blog post at Shower of Roses and Nicole's blog post at Children of the Church in which they did a lesson on praying for the unborn and teaching the culture of life using the free "Ladybug Warriors" lesson created by Culture of Life Studies Program. I was inspired to try this activity this past Sunday afternoon with my family since we didn't get to go to the March for Life this past Friday, January 22 like we did in 2011, 2012, and 2015. 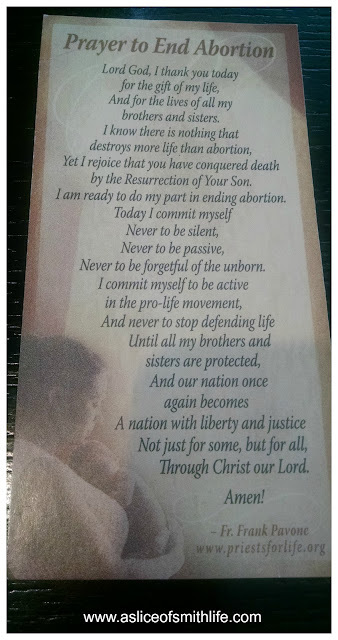 Instead of being physically present at the March for Life this year, we prayed over the weekend for the end to abortion, the marchers' safety while traveling in the blizzard, and all those who are victims of abortion: the unborn, men, women, and all those effected by abortion in numerous ways. 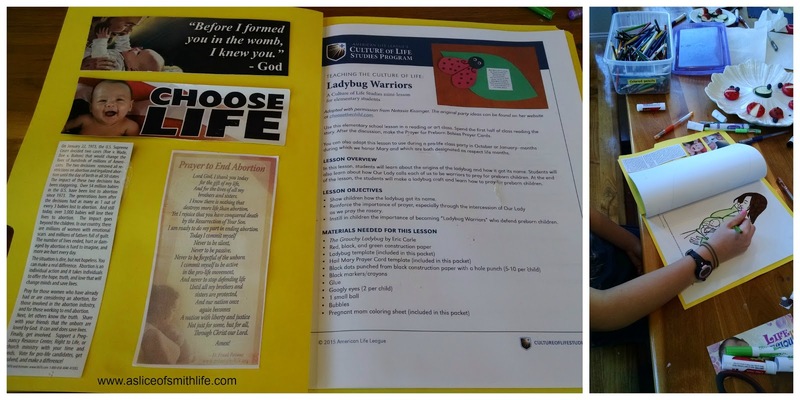 I decided to make each of my children a booklet out of yellow file folders with the "Ladybug Warriors" lesson stapled to the inside. 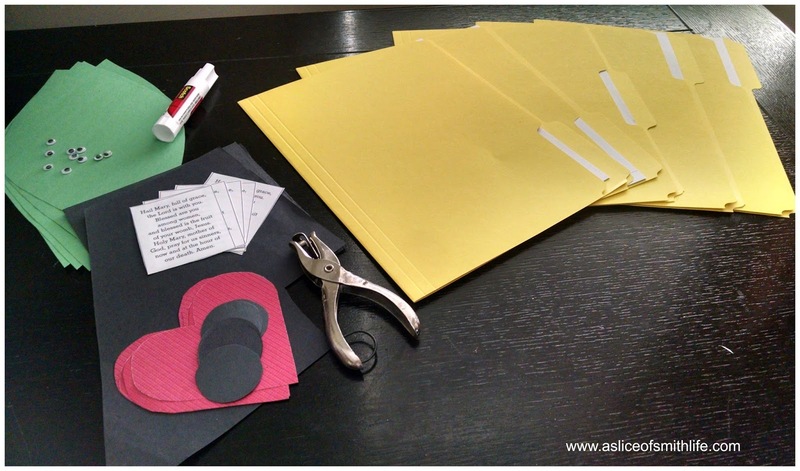 I wanted each of my children to have a printout of the lesson so that if they ever wanted to do this activity again in the future with a friend they will have the lesson on hand. Also, I thought they may remember the lesson better if they had a copy of it. 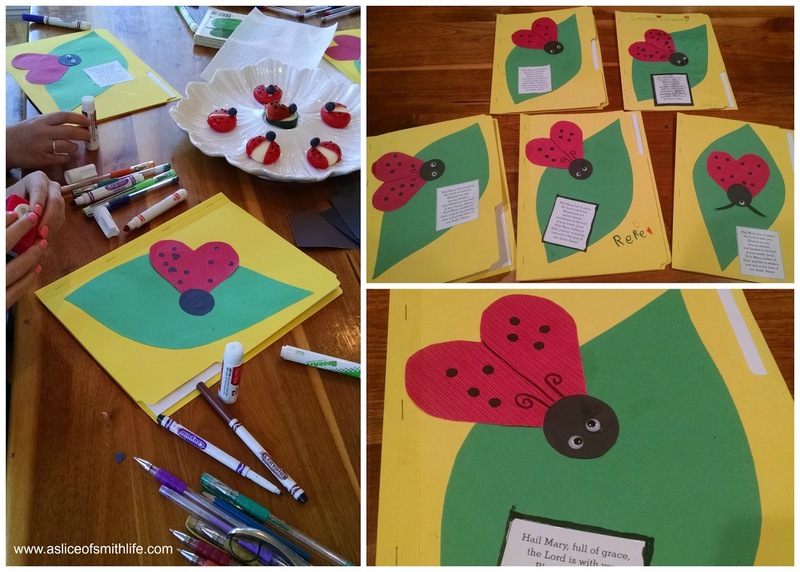 Then the cover of the folder is the ladybug craft included in the lesson. 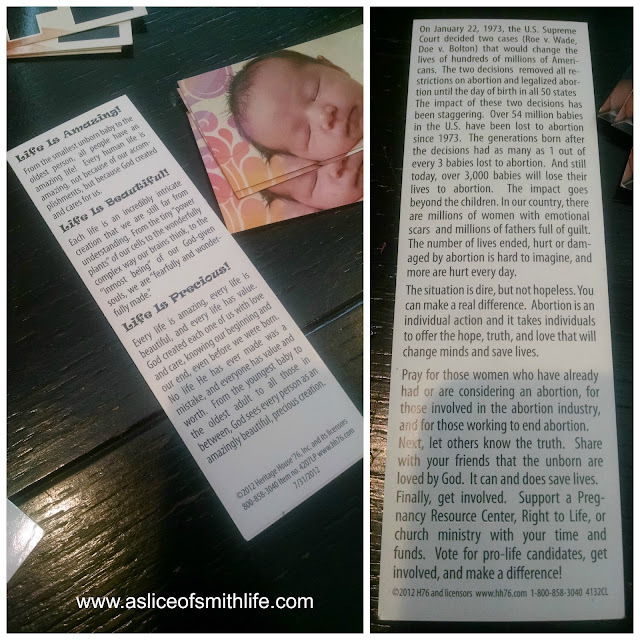 I also had several pro-life bookmarks that I saved from a Teens for Life event with my older children so each of my children glued the bookmarks to the inside cover of the yellow folder with a prayer to end abortion from Priests for Life. 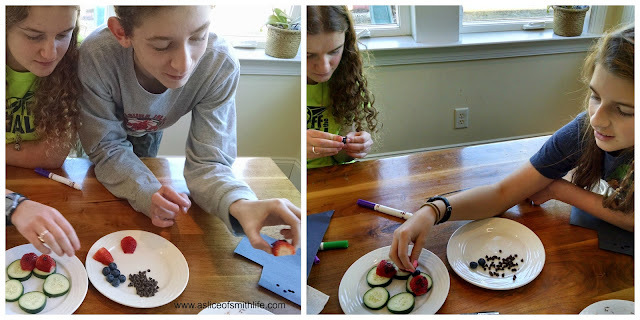 After I read from the suggested book, The Grouchy Ladybug by Eric Carle, my children enjoyed making the ladybug craft using the templates in the lesson. There is also a printout of a woman carrying a baby in her womb that some of my children enjoyed coloring. I also pulled from our bookshelves our big collection of Eric Carle books that I hope to read this week. One of our favorite Eric Carle books that we especially enjoy for Lent (that starts very soon on February 10!) is Walter the Baker where we make pretzels after reading the book! After reading the book and doing the craft I read from the lesson about how the ladybug got its name. My children and husband were surprised that sources say the ladybug got its name from the help of Our Blessed Mother, Our Lady. In Europe during the Middle Ages insects were eating the farmers' crops so they asked Our Lady for help and soon after the crops were growing and thriving. They then noticed that little red bugs with black spots, or "The Beetles of Our Lady" were eating the pesky insects that were ruining the crops. The name was eventually shortened to Lady Beetle or ladybug. 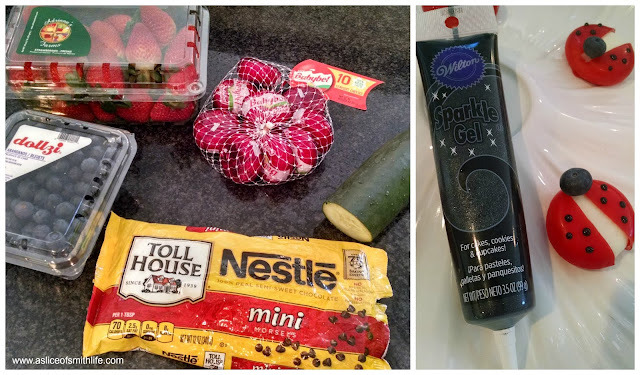 The lesson includes snack ideas and I also went on Pinterest to find an easy snack made with mini Babybel cheese (and I used Wilton Sparkle Gel to make the dots on the red wax) and my children and I also made ladybugs with strawberries, blueberries, and mini chocolate chips on top of a cucumber slice. 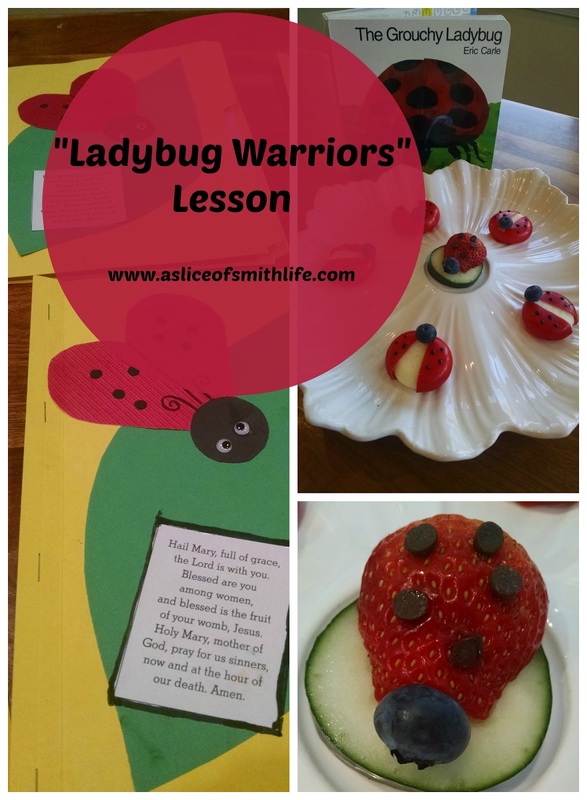 As suggested in the lesson, our family concluded this fun activity by saying a decade of the rosary, the greatest weapon as a "Ladybug Warrior". 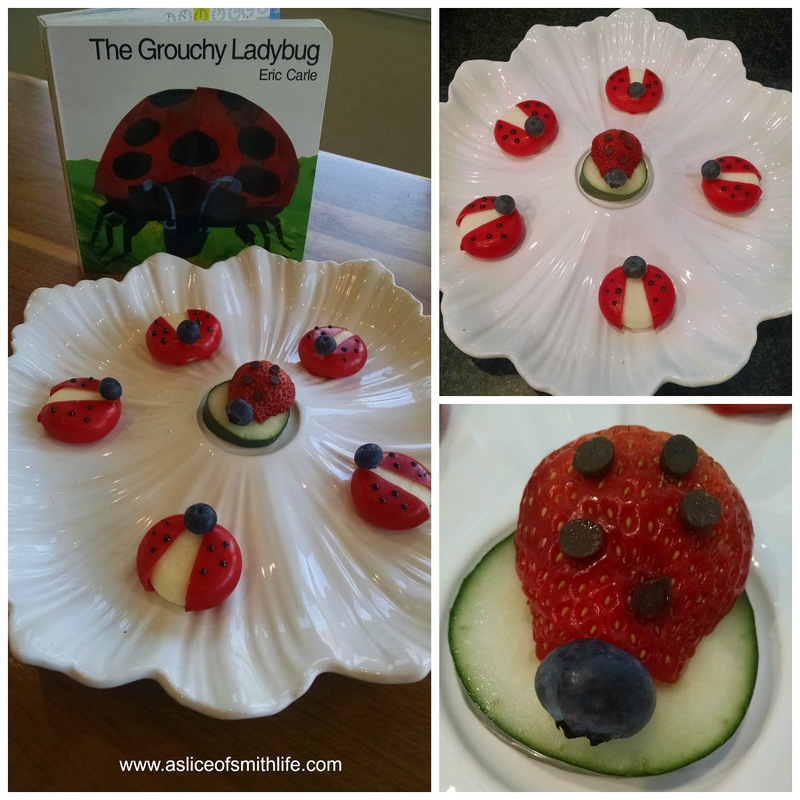 Doing this easy, but meaningful lesson with my children reminded me of the ladybug cake that I made for my daughter on her first birthday! She is now 15! I don't think I knew back then the history of how the ladybug got its name so I'm thankful our family now knows how very special the ladybug is and to never stop being a "Ladybug Warrior" and supporting and praying for all life in all stages! 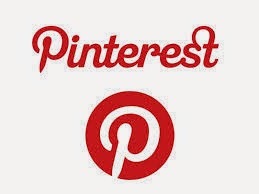 I have a Pinterest Pro-Life board called "L.I.F.E. 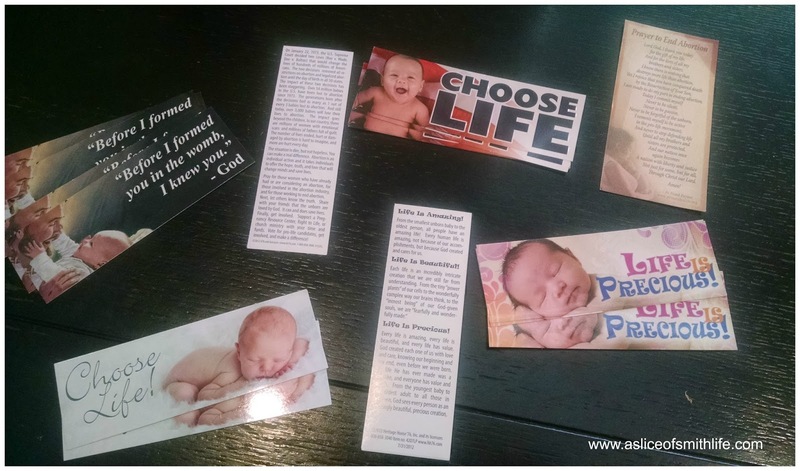 = Life Is For Everyone" that I created awhile ago, where I have been collecting pro-life posts. Please check it out and repin away to help spread the message of life to all the world! This excites me so much to see what God has done!! He gave me the idea for this lesson about a year and half ago. 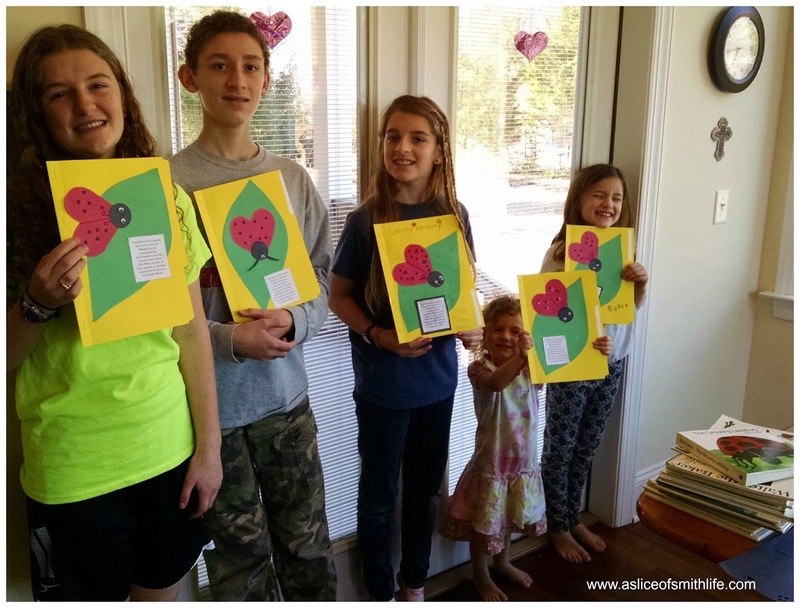 Mary with Culture of Life recently saw it on website and asked if they could share it with others. I am honored that they asked me and that all of you are sharing your awesome experience with it :) For more ideas on building a Culture of Life, please take a peek at my website ChoosetheChild.com. What a phenomenal, ambitious, meaningful activity!!! Loved every single thing...great pics too, Tracy!! Thank you so much for stopping by, but most importantly thank you for creating this life-affirming and fun lesson! Thank you for all you do to share the culture of life! I will be checking out your website, most definitely! God bless! It was alot of fun! 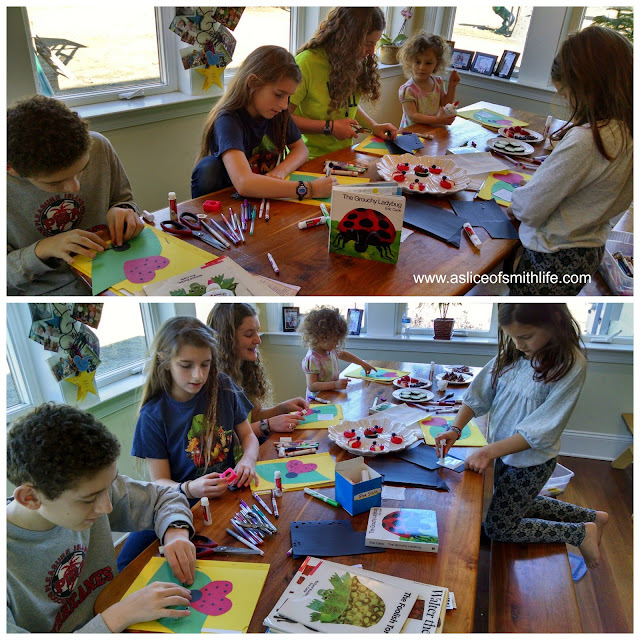 Planting seeds how we are able right? :) I've heard so many great things about Culture of Life Studies Program and now Natasia's website! It's such a blessing to have such wonderful pro-life resources isn't? Thanks always for stopping in and commenting Chris! I always enjoy your visits and comments! Love your little cheese ladybugs! So cute and creative!